MANILA, Philippines – Junemar Fajardo won his 2nd straight MVP award. 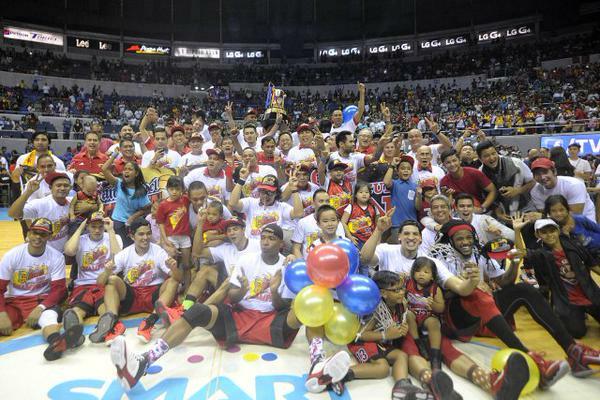 The sweeter part is: his team, San Miguel Beermen (SMB) swept the Alaska Aces 91-81 to win the Governor’s Cup Title, on Friday, July 17, 2015 at the Smart Araneta Coliseum in Cubao, Quezon City. Junemar Fajardo has just recently won his 3rd Best Player of the Conference Award in less than a week and tonight, his cabinet will once again be overflowing with prestigious trophies as he won the: Sportsmanship Award, Defensive Player of the year, 1st Mythical Team of the year and back-to-back Most Valuable Player awards. Coach Leo Austria was very eager to finish this series but told his boys not to be complacent and keep on working hard until the final buzzer sounds. Coach Alex Compton, on the other hand was very optimistic to bounce back and make a history. The Aces won the opening jump ball and Cyrus Baguio made a back-to-back layups followed by Calvin Abueva’s 2 for 2 at the foul line for a 6-0 run that prompted Coach Leo Austria to call an early timeout. AZ Reid and Marcio Lassiter fired bombs from down town which signaled that this game will be a 3-point slug fest, at least for the Beermen. Romeo Travis didn’t really want to pack his things and fly back to his homeland. He was shooting flawlessly in the first 2 quarters of the ball game. At 2:45 of the 2nd period, Junemar Fajardo committed a very rare Flagrant Foul 1 for hacking and clamping on Romeo Travis as a duty foul to prevent the latter from scoring and increase the Aces’ lead. After the official review, the referees confirmed that it was a FF1. Fajardo sat out for 3 minutes as a penalty. Calvin Abueva and Ping Exciminiano took advantage of Junemar Fajardo’s absence and scored bigtime before the first-half ended. The Alaska Aces just like games number 2 and 3 dominated the first half of the ballgame. They headed to the dugout with a double-digit 12 point lead. Junemar Fajardo stayed on the bench at beginning of the 3rd quarter for less than a minute to complete the 3-minute FF1 penalty imposed on him. “The Kraken” finally sent back to the floor and things turn around in favor of the Beermen. Junemar Fajardo was omni present underneath the basket and was able to convert all the drop passes and put backs and the main reason why San Miguel caught up. Arizona Reid started the 3-point bonanza hitting in all angles of the rainbow territory. Reid fulfilled his promise to give himself and the Beermen a championship before he hangs his PBA jersey and retire from overseas contracts. Reid waxed hot from the outside and overcame Alaska’s dozen point lead. “I finally got one. It took me 4 years.” Said Reid during the postgame interview. The Aces never made a comeback after losing their big half-time lead. In frustration, Romeo Travis accidentally threw a bottle of water to a PBA courtside reporter. With this win, San Miguel bagged its 21st title and 2 championships against the Aces this season. They beat Alaska at the All Filipino Cup 4-3 and a sweet sweep at the Governor’s Cup. “Hakot Award” never stops for Junemar Fajardo as he won the PBA Press Corps – Holcim Cement Finals MVP. SMB Governor Robert Non thanked their bosses, the fans and Coach Leo Austria for the 2 championships. “The Glory Days of San Miguel Beermen is really Back!” Cited by Non. Coach Leo Austria gave San Miguel its 2nd Championship in a single season. Way back in Asean Basketball League (ABL) couple of years ago, Austria assumed the late Bobby Parks Sr.’s head coaching position and gave the same team its lone title in the ASEAN level where he started honing and mentoring “The Kraken”. Nothing to be ashamed of for the Alaska Aces, they did a great job and in fact they almost won games 2, 3 and 4. They just had meltdowns in the dying minutes. “2 Championships in a season is not bad… Because of Alaska, we learned to work hard… Congrats to Alaska.” Words of appreciation from Coach Leo Austria to Coach Alex Compton and the Alaska Aces for pushing the Beermen to their limits right from the start of the All Filipino Cup. The PBA will take a 3-month break before the opening of the 2015-2016 season. But before that, fans are really looking forward to the annual draft in early November where this year’s batch is heavily loaded by talented pool of draftees including Moala Tautuaa, Norbert Torres, Chris Newsome, Garvo Lanete and possibly Ray Ray Parks if he doesn’t make the final 15 Mavericks’ roster.